Ready, set go! A frenzied March is upon us! Hit your refresh button as we forfeited an hour of sleep with the switch to daylight savings time! Aah-choo! It’s that time when poor allergy sufferers tote tissue. That dastardly pollen drifting through the air comes from new blooms reaching for the sun. Bets are in for March madness college basketball pools while we catch the last of the NBA season games. The Clippers and Lakers are pulling out all stops to grasp play-off spots! Green is the go-to color on St. Paddy’s Sunday, or beware of the pinch. Spring officially arrives on Wednesday with beautiful weather predicted, thanks to the weather god. Easter comes early, on the last day of this month. Gals, think brighter, lighter, unique! As seasons change, shopping is a sure thing! A pig-tailed lass is too adorable in navy with red hearts “I love mama” monkey pants from the downtown Little Tokyo shop, Monkey Pants. Little Tokyo continues to evolve and surprise as more shops and restos pop up to meet the demands of new city dwellers with a younger vibe. In Japanese Village Plaza, a few doors down from the popular Shabu Shabu House, is Monkey Pants. A quirky name, I thought. An eye-catching clothes line hangs across the front window showing off the super cool leggings, socks and tees. Too irresistible to pass by. Monkey Pants is a new kid’s spot brimming with mostly stuff from Japan. For those in the know about eco-friendliness, the Nadia Biff line with that signature smile is formaldehyde-free. Fun and funky, cuteness abounds. 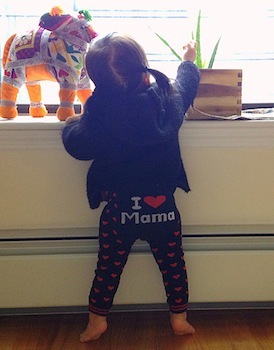 Little kiddos can make their own fashion statements strutting their little “bums” in his and hers monkey pants. Happy faces rule! “Retro toys are making a comeback,” said owner/designer Mychaela Hardy. Snag a new soft and furry Monchichi monkey doll. Originals date back to the 70’s. And kewpie dolls? Now available as small as four inches to 24. 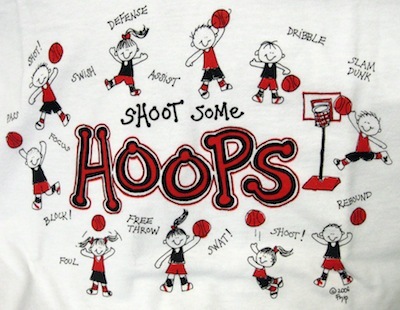 Be on top of your game and go interactive at polkadotwhat.com. Awesome leggings geared to kids from 2 to ten. So trendy are the mix and match contrasting stripes and the star outlines on one leg with colorful circles on the other. Around town, the first Asian arts and crafts show of the spring season opens for business. With fewer shows on the annual calendar, your support of community artisans is needed now more than ever. Head to Krafty Delites on Sunday, March 17 at the Carson Community Center. Artist Frances Yip has doodled most of her life, and now 25 years later, she’s still like the Energizer bunny in motion. “My parents were not ‘typical Asian parents.’ I had freedom to do what I loved to do. They allowed us to do whatever we wanted . . . as long as we went to college,” said the youngest of nine siblings. Her moniker “Smilin’ From Ear to Ear” defines who she is, always with an upbeat flair, influenced by loveable Disney characters and Popeye’s creator, Tom Hatten. Cotton tees are her thing, be it as baby onesies, to anyone bigger than that. Look for Asian themes—foodie delights of sushi, dim sum and oodles of noodles. Looking for custom work that’s out-of-the-ordinary for a reunion, birthday or team? Yip is game. “It is most satisfying when customers enjoy my work, like a positive pat on the back,” she said. Sunday, March 17, 10 a.m.-4 p.m.